This guidance is intended for persons who prepare packages containing waste contaminated or suspected of being contaminated with Ebola, for transportation to off-site treatment and disposal. It provides guidance on DOT regulations regarding the transportation of a Category A infectious substance only and highlights some of the requirements of the HMR, which can affect transportation safety. This document should not be used as a substitute for the HMR to determine compliance. 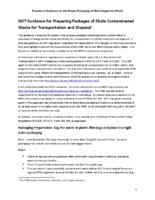 U.S. Department of Transportation (DOT), “Procedural Guidance on the Proper Packaging of Ebola Suspected Waste: DOT Guidance for Preparing Packages of Ebola Contaminated Waste for Transportation and Disposal,” NETEC Repository, accessed April 21, 2019, https://repository.netecweb.org/items/show/456.